I’m an almost-diabetic who uses low-carb food intake to maintain my excellent blood sugar, so citrus juice, which is a pretty concentrated belt of sugar, is mostly out of my diet. I also love oranges and orange flavored things, and don’t like artificial flavors. So for a while I have been following with interest the analyses showing very high antioxidant activity in citrus peel and wondering how to incorporate it into my diet, and recently I got a chance to test this when I came across a bonanza of 20 large organic navel oranges that could not be sold because they had soft spots. 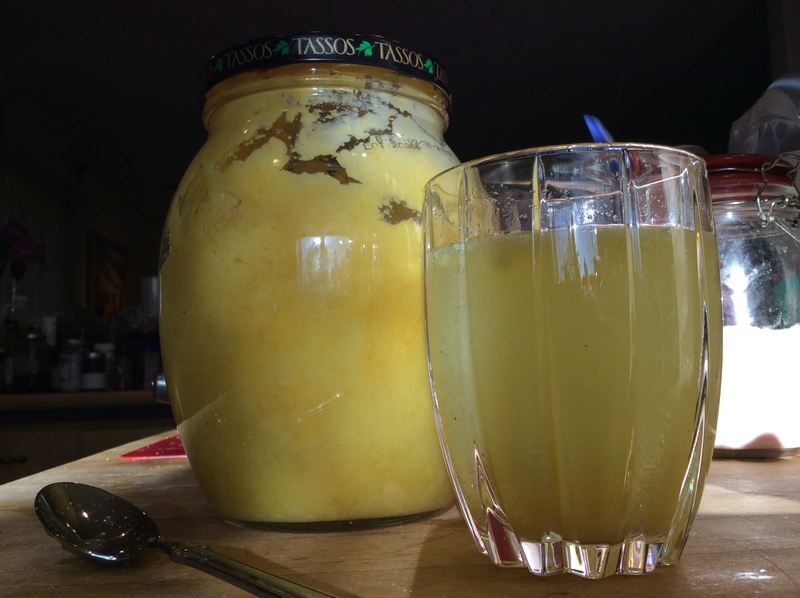 I could have made orange-cello liqueur, but wanted something I could drink with lunch. So I washed the oranges carefully, cut out the soft spots, cut them into chunks, and puréed them in batches in my blender with only enough water to keep the purée moving. Each batch was blended at the highest speed for over a minute, to make sure it was completely liquefied. I have a Vitamix, and I don’t really know how well this would work with other blenders, but probably well enough. Please note that the oranges I was using were seedless. If you try this with seeded oranges, the seeds have to be carefully removed because they are intensely bitter, and this technique will not work at all with lemons because their inner white pith is so bitter. I haven’t experimented with other citrus. I would say that tasting a little slice of the white pith might be a good test. If it’s very bitter, it might not work to use it this way. I think that blood oranges would work well, and I plan to try as soon as they come into season. Also, organic really matters when you are using the peel. You end up with a thick smooth purée that is only very slightly sweet, has a hint of bitterness, and is loaded with orange flavor and all the nutritional value than oranges have to offer. I use two or three tablespoons in a water glass, fill it with sparkling water, and sweeten with stevia sweetener. When you get near the bottom of the glass, be sure to swirl it around and drink up all the particles that settle to the bottom. Overall I’m probably taking in about a tablespoon of pure orange juice per glass, so the carb content is not high enough to worry me. I have also added it to a low-carb coffee cake with good results. Because of the intense flavor that the peel adds, you don’t need much. 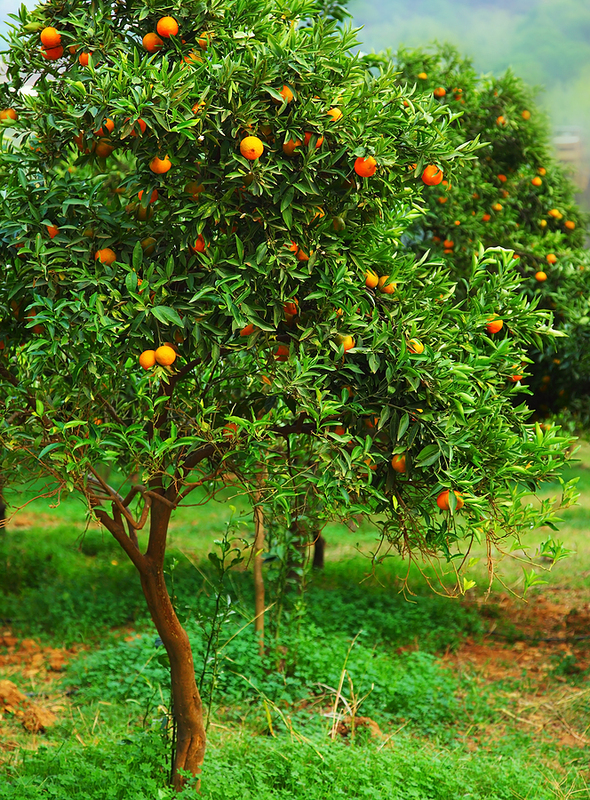 Orange trees are strikingly beautiful, and if you live in the citrus zone they are great edible landscaping material. If you do a web search on citrus peel you will find articles suggesting that there are few diseases it won’t prevent or cure. Let’s not get carried away. The antioxidants that it contains, including naringinen, hesperadin, and rutin, have some interesting anti-inflammatory activities, and there is no documented evidence that ingesting some amount of citrus peel and pith is harmful. It’s also a superb natural source of vitamin C, which can be a bit short in a ketogenic diet. It makes thrifty use of something ordinarily discarded, and it tastes good, adding strong flavor and a touch of bitterness that makes an adult drink out of a fruit that can otherwise be too sweet to enjoy very much of. 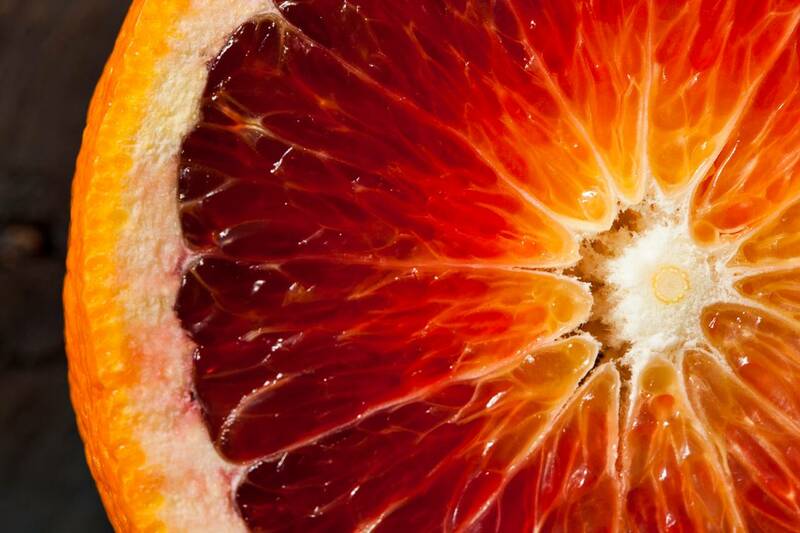 You can read about its various possible benefits at the links below, including the interesting demographic information from the REGARDS study that higher levels of citrus consumption correlated with lower levels of ischemic stroke. Make of that what you will. 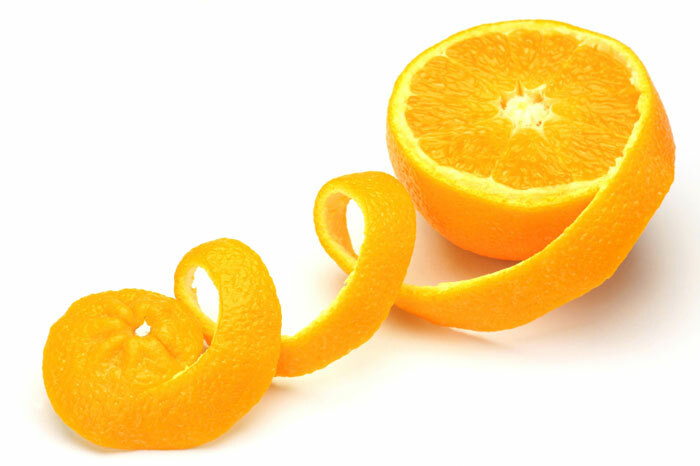 There are other possibilities for eating citrus peel. I came across the following recipe while searching, and haven’t tried it yet, but it does look lovely, doesn’t it? 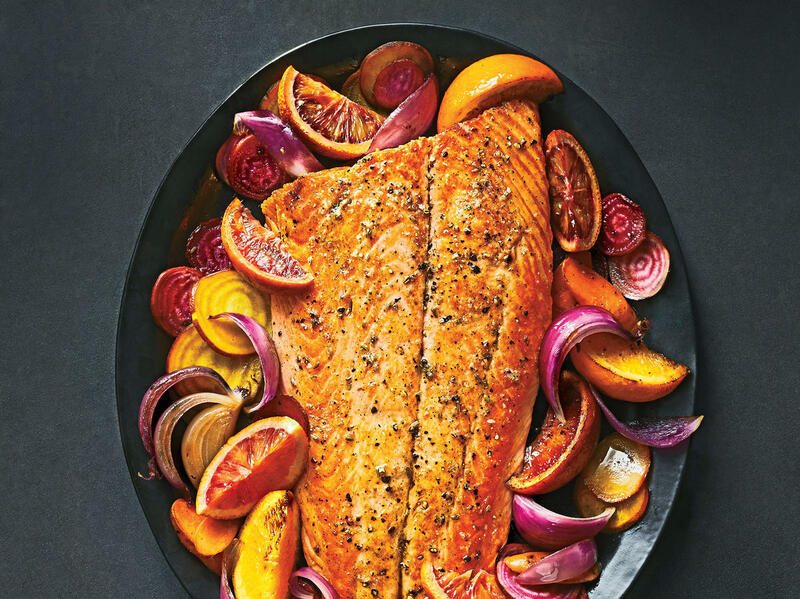 Personally I would roast the fruit-veggie mixture first to soften them more, then the salmon by itself, since I despise overcooked salmon.